After a sad showing yesterday attempting to night fish pathetically lethargic crappie, a few of my buddies and I decided it was a good day to make up for it and chase flags on Lake Champlain. Of course, we would pass the time between flags by jigging panfish. Overall, we had a fairly successful day. The weather was decent but it didn’t take long to change to snow though. Better than rain I guess! 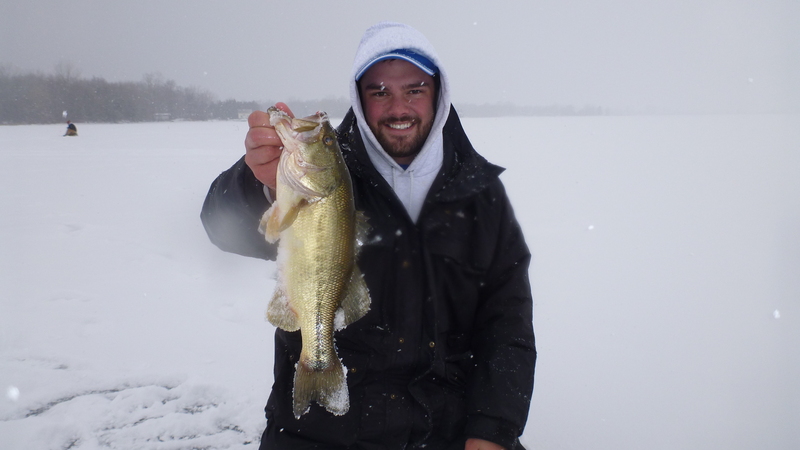 We stopped at Dockside to pick up bait and headed for the ice around 7am. We got three dozen medium/heavy shiners and were set up with about 20 tip ups out by 8. The flags didn’t take long to start popping. I forgot how much action there can be fishing like this. I wish I had wore a pedometer! At the beginning of the day we were pretty civil approaching our traps that had been tripped. We took turns and walked fast at best. By the end of the day it was an all out sprint with plenty of stiff arms to be had. We all had plenty of chances at fish in the end. We had two different set ups on our tip ups. One set was rigged with steel leaders the other had straight 8 pound fluorocarbon. None of us noticed any difference in the number of flags on one style or the other. The only difference was break-offs. Obviously, when fishing the toothy critters of the Esocidae family (northern pike and pickerel), line durability is a big concern. The fluoro had several break-offs while the steel leaders had none. Makes sense right? I have read stories and articles about how in certain locations using a steel leader will completely shut off the fish from biting while some times they prefer it. Obviously, the fish today were not too worried! Perfect! 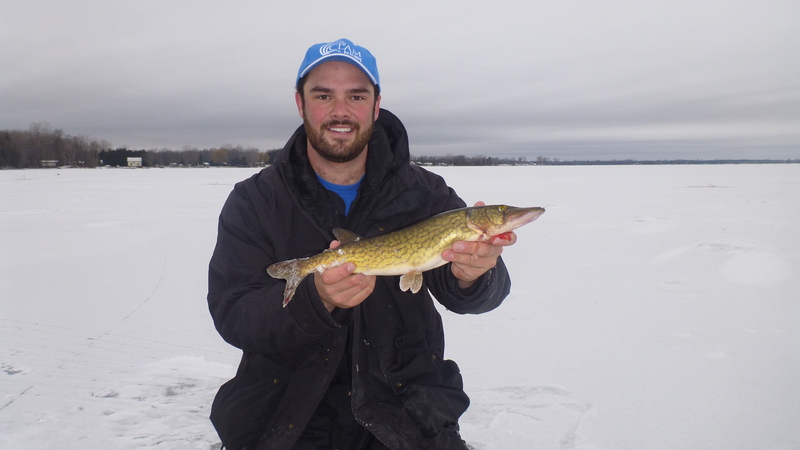 Throughout the day we landed quite a few bass, pickerel, and northern pike. 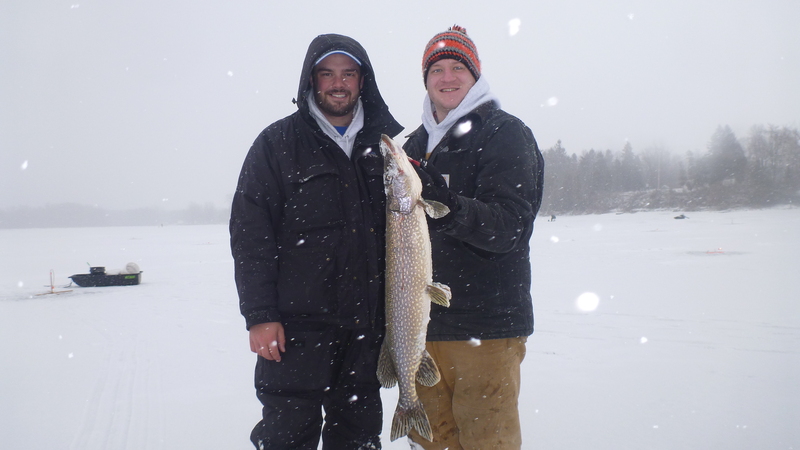 Although none of the fish were huge, two of the pike were over 30″. Jigging pannies was decent all day but they never seemed to school up like the did the last few days. Lots of hole hopping was necessary! At the end of the day, all the guys jigging were spread out far more than normal in a large area. I could think of a million worse ways to spend a Tuesday! If nothing else, we provided entertainment for all the guys out there as we ran for flags!